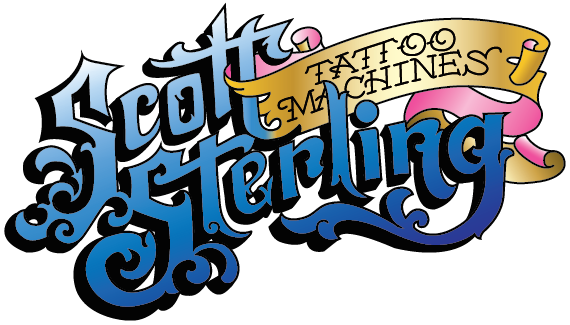 Scott developed this liner because he gets asked for liners with a longer stroke that will handle a wide variety of needle groups. In the early 90’s he made a machine similar to this on a brass frame that was intended to be used for large round shaders. Scott has been making a Jonesey style KolorKing machine since the late 80s early 90s. The original KolorKing was built on the brass national copy of a Jonesy style machine with a yoke that Scott built at China Sea during the 80's and 90's while he worked with Mike Malone. China Sea was located at 1033 Hotel Street in Honolulu, which Malone purchased after the death of Sailor Jerry. After Scott sold out of the original, limited run Sailor Jerry/Paul Rogers bent back liners he liked the geometry of that frame so much he decided to use it on the new Kolorking liners and shaders. This new version of the improved Kolorking liner has a traditional Jonesy style brace and a pinch tube Vice. The new improved version of the Kolorking is milled and drilled from a solid Billit of 1018 steel on a CNC mill for the greatest precision. The end result is a sturdy, well balanced and versatile machine that will last you the rest of your career. By manipulating spring gauge combinations, A-bar length and changing the geometry of the frame Scott has come up with a long stroke liner that can run delicately and fine while still able to push larger needle groups while running fast and staying cool.